Habanos lovingly refer to this Piramides as the Grand Lord (only regular production Piramides in the Cohiba brand). It is a generous cigar in all senses of the word, leaving you with a giddy smile and a feeling of well being long after you have finished your smoke. 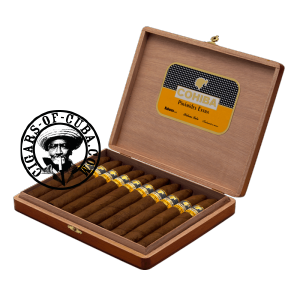 This new Cohiba cigar carries the holographic Cohiba band and comes in boxes of 10 cigars. This Cuban cigar starts off calmly, exploring aromas of coffee, bean and gentle leather before an increase in intensity in the second phase, with the introduction of distinct exotic woody notes. The fat diameter and conic shape gives you the impression of floating through the cigar. The finale does get stronger, but more in the intensity of flavor, rather than raw power. The blend is similar to the blend used for the Cohiba Behike Linea, incorporating the rare 'medio tiempo' leaves, which helps to develop an exceptional character and flavor.